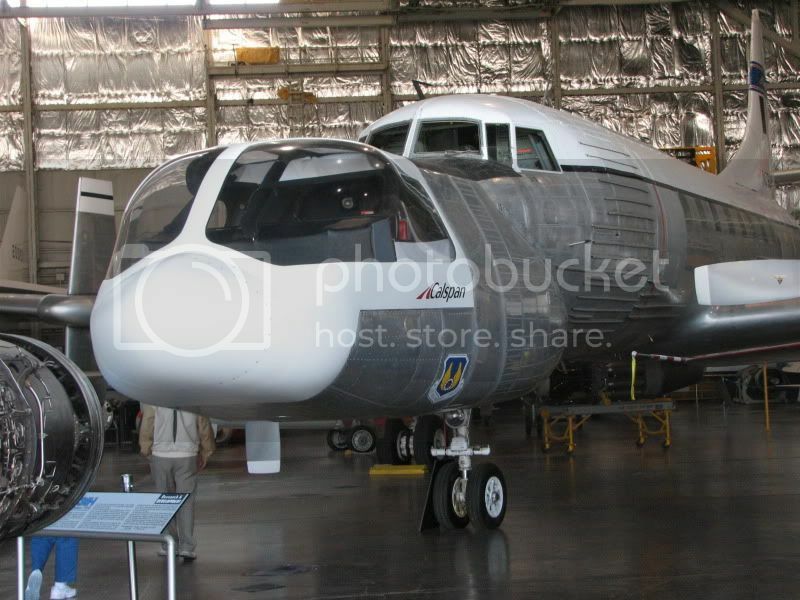 When I first saw this, I thought there was a plane displayed in front of the Convair. Then I realized it was all one plane! I believe that's an in-flight crew training simulator. It's pretty awesome. Wouldn't want to figure the weight and balance on that thing. How do they get in there? How do they get in there? It's one of those strange odysseys of military procurement: the design team blueprinted access from the Convair cockpit through a hatch between the rudder pedals, the implementation team designed an external hatch just forward of the nose gear, but the construction team could never get a straight answer from the coordination team so the thing was built with no hatches at all, but facility for remote piloting from the ground by servos and cameras mounted where the crew seats would have been had there been enough money in the program to buy crew seats, which there wasn't. Funny thing is, being a militray program, nothing about the way the project turned out struck anyone involved as the least bit unusual. What's even stranger is that the Pentagon's title deed to this aircraft also lists the Brooklyn Bridge as accessory equipment. hahahahaha! LOL! thats funny! Top hole find!